Notes: May 1998 - A particularly fine, straight, thickly fluted and solid looking bole. It has apparently suffered at the hands of topiarists at some time in its history. A small opening at the base of the tree reveals that it has larger hollow spaces with internal growth. Latest information: 7th March 2006 - A site meeting was held with members of the local community to discuss this fine tree as part of the Great Trees of East Devon project. 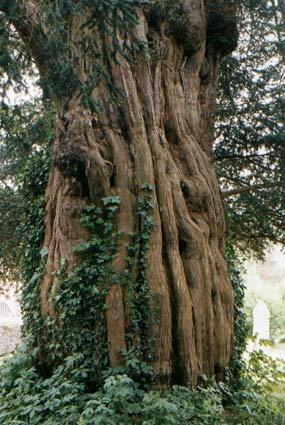 Later in the year the yew was nominated by Heather Wheeler and is now officially recognised as one of the Great Trees of East Devon.